I had the privilege of accompanying OIS students on Saturday to their visit to the Sannoh Children’s Center. The mission of the center is to provide after school care for children in one of the poorest wards in the city of Osaka. 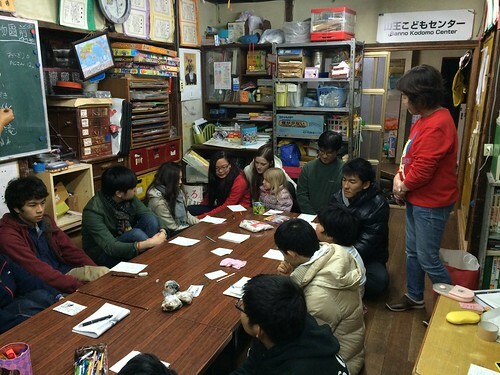 In the photo above, center president Maeshima Mami leads a reflection discussion with our students and other volunteers. The students had returned from the yomawari or night patrol. Adult volunteers and children once a month prepare and deliver onigiri, which is Japanese rice wrapped in seaweed, and blankets to the homeless men of the Kamagasaki neighborhood of the Nishinari-ku ward. Kamagasaki is the popular name of the area and its use is discouraged by the government as it is associated with the large homeless population. The homeless of Nishinari-ku are mostly elderly male blue collar laborers. For the usual reasons, like gambling addiction, alcohol, mental health, etc, they have come upon tough times. Mami-san gave the three groups instructions before leaving the center. I walked with one of the groups led by her, and our students encountered about 10 homeless men, sleeping on the streets of shopping arcades. They were usually against a wall and they spread newspaper on the ground and put up cardboard pieces to shelter them a bit from the elements. All of them were very gentle and appreciative of the blankets and food. There are also shelters in the area that provide some beds and organize 1-day odd jobs for them with companies or people needing manual labor. There are also low cost hotels if they have some income. The team prepares the onigiri. I thought the Sannoh Children’s Center was crazy for having children walking the streets in such a notorious ward at night. It turned out to be quite safe and heartwarming, as the men were so grateful that someone noticed them and wanted to help. Crime rates are extremely low in Japan compared to other industrialized nations and violent crime. I was much safer in Nishinari than in the poor urban areas of my home country of the United States. When we got back to the center, we all reflected on our experience. We gained an understanding of the plight of the homeless men in Japan. The homeless are not to be feared, but to be cared for. The work of the Sannoh Children’s Center and others in the ward should be supported more by the government and private citizens. I would like to thank our CAS and Community and Service Coordinator, Lyn Melville-Rea, for organizing this program for the school. She has been taking students down there for years and the center and our students have benefited from her efforts.